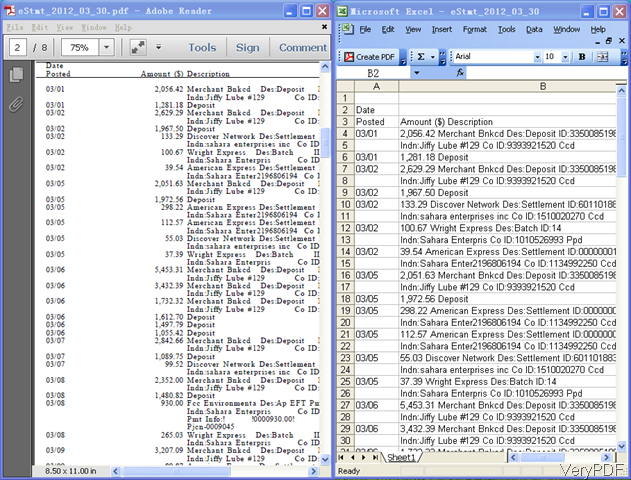 ← Is there a way to export the data (file name, page count, file size, information) to an excel spreadsheet? I an wanting to know which products to purchase. Project Title, Parsing PDF files in to Multiple PDF. I am a .Net Developer that needs the ability to read a single PDF and output several PDF Documents, whenever a specific data field changes. ie " Facility = 0014 " next extract is "Facility = 0035 "
I also need the ability to Parse PDF files into Excel files. Which SDK products do I need?? Also, is there a Developers toolbox that covers all SDK Products? >>I am a .Net Developer that needs the ability to read a single PDF and output several PDF Documents, whenever a specific data field changes. >>ie " Facility = 0014 " next extract is "Facility = 0035 "
You can use "PDF to Text Converter SDK" to extract text from PDF pages first, locate the specific data field, figure out the page range when this specific data field changes. After you get the page range, you can call "PDF Split-Merge COM/SDK" to split the PDF pages. >>I also need the ability to Parse PDF files into Excel files. We haven't a trial version for "VeryPDF PDF to Excel Converter SDK" product yet, but you can download the "VeryPDF PDF to Excel Converter GUI" from this web page for evaluation, "VeryPDF PDF to Excel Converter SDK" and "VeryPDF PDF to Excel Converter GUI" are based on same source code, if the Excel files which generated by GUI version reach your requirements, the SDK version will meet your requirements too. >>Which SDK products do I need?? Please look at above answers for more information. >>Also, is there a Developers toolbox that covers all SDK Products? We haven't a single developer toolbox that covers all SDK products, you need to purchase the different SDK products separately. This entry was posted in PDF to Excel Converter, PDF to Text Converter and tagged pdf split, PDF to Excel, pdf to text, split pdf content. Bookmark the permalink.